Many of my readers will be aware that during the last few years a theological controversy has arisen over the doctrine of divine impassibility. Impassibility is the teaching that God, being perfect and immutable, cannot be moved. The idea is expressed within many of the Reformed confessions by the assertion that God is “without passions.” The idea is that God, who in his essence is perfectly blessed, can never suffer any loss. Therefore the experience of suffering is contrary to the divine nature; God cannot suffer. It is imprecise to say that God has no emotions; what in us may be called an emotion (such as love) is a virtue in God. However, whereas in us emotion involves fluctuation and change in our disposition, God is changeless. His love is like his power, his wisdom, and indeed his very being; it is infinite, eternal, and unchangeable. 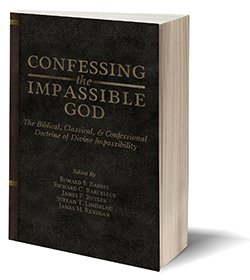 In the Spring of 2014 the question of impassibility became the focus of an open debate within the Association of Reformed Baptist Churches of America when that association’s Theology Committee reported that one of the member churches evidently did not hold to the 1689 Confession’s teaching on impassibility. This was the result of an ongoing process in which the committee had been assigned to investigate the writings of one officer of that church. They had earlier found his writing contrary to the confession at two points (although he and his church had by 2014 come to a mutual agreement with the committee on the proper confessional expression of the other point). Rejection of the confession is grounds for exclusion of a church from ARBCA, and the association found itself at an impasse while some – but not all – argued that associational documents required that this action be taken. In Ephesians 4:8, Paul quotes from Psalm 68:18, and then shows us how we are to make a right use of reason or to exercise the intellectual and moral faculties: “Now that He ascended, what is it but that He also descended?”: the exaltation of Christ presupposed a previous humiliation. Carver was ecumenical in spirit and identification, and refused to confine his mission parameters to Southern Baptist parochiality. Dale Moody regards Carver as a philosopher and theologian. To him (Moody) Carver was captive to God’s word that exhorted, “Prove all things; hold fast that which is good” (I Thess. 5:21). Moody further characterizes Carver as having “too much integrity to be evasive and too much courage to be silent,” insisting that in any issue of significance, one might not know how this professor and personalist, was basically a biblical theologian, who focused strongly on the kingdom of heaven, and on the church as the body of Christ. Carver opposed Landmarkism, Fundamentalism and Dispensationalism by his masterly biblical scholarship. Carver’s philosophy of life contributed to his interdisciplinary perspective of academics, making him possibly the greatest scholar Southern Seminary has ever produced. In addressing what are called ‘the Great Heresies,’ it is important for us to recall that heresies usually represent what Alister McGrath has called ‘a failed attempt at orthodoxy,’ (Heresy [London, SPCK, 2009] p. 13) an attempt to make sense of the Bible that fails to take into account the full richness of the Biblical revelation; rather than being outright repudiation of the Bible. The result is that a part of the truth is treated as the whole of the truth, and thus becomes an untruth. The reason for this is not that the Bible itself is unclear, but that ‘untaught and unstable men’ twist it to fit their own worldly thinking. To speak of the development of the doctrine of the Trinity is practically to invite misunderstanding, suggesting as the very phrase does that the Trinity is an invention of theologians. On the contrary, it must be emphasised that the New Testament is a fully Trinitarian document; as Leon Morris has put it, ‘the deity of Christ was held from a very early date. It is not to be regarded as the culmination of a process of slow growth and reflection’ (The First and Second Epistles to the Thessalonians [Grand Rapids, Eerdmans, 1959] p. 111). Despite the common accusation that the doctrine of the Trinity is the result of imposing an alien philosophy on the Bible, the reverse is the case; it is non-Trinitarian teachings that are the result of imposing alien philosophies on the text of Scripture. Orthodoxy came first, since it is the Scriptural teaching; heresy, the result most often of attempts to explain what cannot be explained, comes later, working on the Biblical revelation and distorting it. Orthodox theologians were then forced to go back and explain what the Bible actually says so as to refute false and distorted claims about the Bible’s teachings. 2. But the second thought is, the means of salvation. It is, “Look unto me and be ye saved.” You have often observed, I am sure, that many people are fond of an intricate worship-an involved religion-one they can hardly understand. They cannot endure worship so simple as ours. Then they must have a man dressed in white, and a man dressed in black; then they must have what they call an altar and a chancel. After a little while that will not suffice, and they must have flowerpots and candles. The clergyman then becomes a priest, and he must have a variegated dress, with a cross on it. So it goes on: what is simply a plate becomes a paten, and what was once a cup becomes a chalice; and the more complicated the ceremonies are, the better they like them. They like their minister to stand like a superior being. Michael A G. Haykin, who is Professor of Church History, at Heritage Baptist College and Theological Seminary, London, Ontario, examines the transformation in Particular Baptist identity that took place in the eighteenth century. In the past century, there has been considerable debate as to the roots of the Baptist tradition. It has been argued by some scholars that Baptist origins should be traced back to the sixteenth-century Anabaptist movement on the European continent and its offshoots in England. On the other hand, there have been Baptist historians who have maintained that Puritanism and its struggle during the late 1500s and the first half of the 1600s…..